This time saving Tabata workout moves so fast it's hard to get bored, but what's the best part about this workout? It works your entire body and there is no equipment needed. No equipment needed means you are lucky enough to do this fat blasting, full body tabata workout anyplace you choose. At home, on the road, in the gym - anywhere. A LITTLE INFO ON TABATA - Tabata Is 20 seconds of work, followed by 10 seconds of rest for 8 rounds, which equals a 4 minute workout. But you don't get off that easy, as you then repeat this 4 minute circuit usually anywhere from 3-5 times, resting 1 minute between circuits. To get the full benefit from a tabata work you need to go full blast for the 20 seconds of work. Full blast, all out, no holding back! One thing you do need to do a tabata workout? A tabata timer. Lucky for you, your Gymboss Classic or miniMAX makes the perfect tabata timer. 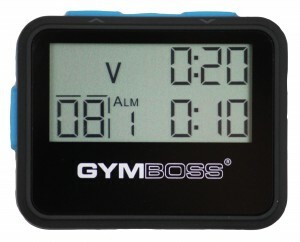 Using a Gymboss as your tabata timer allows you to focus fully on the workout and not staring at a clock. It will beep or vibrate to let you know when it's time to start and stop each exercise. This workout involves 4 different circuits of tabata, so you actually perform a total of 8 different exercises, that work the entire body. This gives you a great fat burning workout. Perform each set for the full 8 rounds (4 minutes total), then rest 1 minute and move on to the next round.